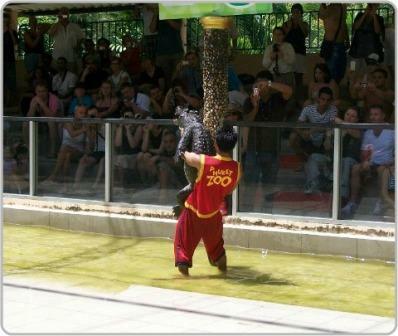 Phuket Zoo is just one of the many attractions and things you can do while on holiday on the Island. And believe me every taxi driver and Tuk Tuk driver will offer to take you there. However, before you decide to go to the zoo, please read on. The zoo is only relatively small, with a variety of animals including birds, elephants, tigers, monkeys and reptiles. Throughout the zoo you will find paths that lead through the well maintained gardens, shaded by large overhanging fig trees which provide much needed relief from the hot sun. Unfortunately the gardens are the best part of the zoo, which seem to be more cared for then the poor animals that are kept in the zoo. Many unsuspecting visitors like to go to the zoo to see the tigers and to have photos taken with them. A visit to the zoo is not for everyone and one that we personally won’t do again. The animals are kept in small concrete and wire enclosures and their living conditions are very poor in comparison to what you would expect from a reputable zoo. The main attractions at the zoo are the three live shows that are held daily featuring elephants, monkeys and crocodiles. The first show of the day is the monkey show, the monkeys will entertain you with a maths lesson, play basketball and perform many other tricks that they have been taught. The next show is the elephant show which includes balancing acts, dancing and soccer, after the show you can feed or ride the elephants and have your photo taken with them. 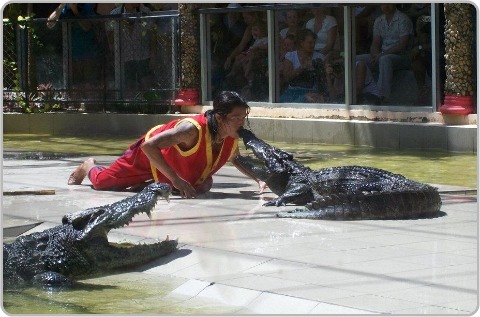 The crocodile show is where you can see the crocodile trainer put his head into the crocodiles mouth. Unfortunately, the zoo is more like a circus show, at the expense of the poor animals, who are housed in small enclosures. Onsite there is an orchid garden and a small aquarium, the entrance to the aquarium is interesting as you have to walk through a giant crocodiles mouth to get inside. If you are interested in underwater attractions the Phuket Aquarium has a lot more variety and is worth a visit. So if you’re planning on going to the Phuket Zoo, please take the time to do your own research, like reading reviews from other travellers on TripAdvisor before you decide to go. The Zoo opened in 1997 and is a privately owned and operated business. The zoo is located about 15 minutes from Town and is opened daily from 8.30 am to 6.00 pm. 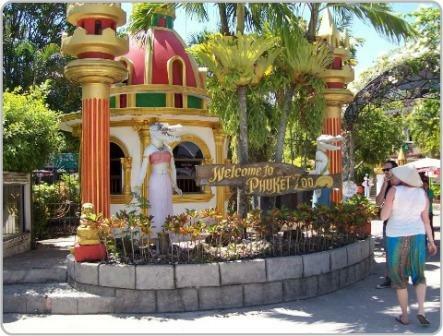 If you are still interested in going to the Phuket zoo and want more information about show times have a look at the zoo's website and read reviews on trip advisor before you go.